This article is about the U.S. state of Oklahoma. For other uses, see Oklahoma (disambiguation). State song(s): "Oklahoma (Rodgers and Hammerstein song), Oklahoma Hills"
Cartoon: Gusty created by Don Woods, Oklahoma's first professional meteorologist, used on KTUL-TV from 1954 to 1989. Released in 2008, as part of the state quarters series. Oklahoma's state bird flying above its state wildflower. Oklahoma (/ˌoʊkləˈhoʊmə/ ( listen); Cherokee: ᎣᎦᎳᎰᎹ, ogalahoma; Choctaw: Oklahumma) is a state in the South Central region of the United States, bordered by Kansas on the north, Missouri on the northeast, Arkansas on the east, Texas on the south, New Mexico on the west, and Colorado on the northwest. It is the 20th-most extensive and the 28th-most populous of the fifty United States. The state's name is derived from the Choctaw words okla and humma, meaning "red people". It is also known informally by its nickname, "The Sooner State", in reference to the non-Native settlers who staked their claims on land before the official opening date of lands in the western Oklahoma Territory or before the Indian Appropriations Act of 1889, which dramatically increased European-American settlement in the eastern Indian Territory. Oklahoma Territory and Indian Territory were merged into the State of Oklahoma when it became the 46th state to enter the union on November 16, 1907. Its residents are known as Oklahomans (or colloquially, "Okies"), and its capital and largest city is Oklahoma City. With ancient mountain ranges, prairie, mesas, and eastern forests, most of Oklahoma lies in the Great Plains, Cross Timbers, and the U.S. Interior Highlands, a region prone to severe weather. More than 25 Native American languages are spoken in Oklahoma, ranking third behind Alaska and California. The name Oklahoma comes from the Choctaw phrase okla humma, literally meaning red people. Choctaw Nation Chief Allen Wright suggested the name in 1866 during treaty negotiations with the federal government on the use of Indian Territory, in which he envisioned an all-Indian state controlled by the United States Superintendent of Indian Affairs. Equivalent to the English word Indian, okla humma was a phrase in the Choctaw language that described Native American people as a whole. Oklahoma later became the de facto name for Oklahoma Territory, and it was officially approved in 1890, two years after the area was opened to white settlers. The name of the state is Pawnee: Uukuhuúwa, and Cayuga: Gahnawiyoˀgeh. In the Chickasaw language, the state is known as Oklahomma', and in Arapaho as bo'oobe' (literally meaning red earth). Oklahoma is the 20th-largest state in the United States, covering an area of 69,899 square miles (181,040 km2), with 68,595 square miles (177,660 km2) of land and 1,304 square miles (3,380 km2) of water. It lies partly in the Great Plains near the geographical center of the 48 contiguous states. It is bounded on the east by Arkansas and Missouri, on the north by Kansas, on the northwest by Colorado, on the far west by New Mexico, and on the south and near-west by Texas. 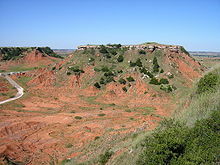 Much of its border with Texas lies along the Southern Oklahoma Aulacogen, a failed continental rift. The geologic figure defines the placement of the Red River. The Oklahoma panhandle's Western edge is out of alignment with its Texas border. The Oklahoma/New Mexico border is 2.1 miles (3.4 km) to 2.2 miles (3.5 km) east of the Texas line. The border between Texas and New Mexico was set first as a result of a survey by Spain in 1819. It was then set along the 103rd meridian. 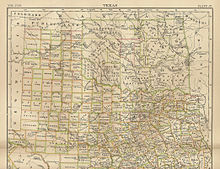 In the 1890s, when Oklahoma was formally surveyed using more accurate surveying equipment and techniques, it was discovered the Texas line was not set along the 103rd meridian. Surveying techniques were not as accurate in 1819, and the actual 103rd meridian was approximately 2.2 miles (3.5 km) to the east. It was much easier to leave the mistake than for Texas to cede land to New Mexico to correct the surveying error. The placement of the Oklahoma/New Mexico border represents the true 103rd meridian. Cimarron County in Oklahoma's panhandle is the only county in the United States that touches four other states: New Mexico, Texas, Colorado, and Kansas. Oklahoma is between the Great Plains and the Ozark Plateau in the Gulf of Mexico watershed, generally sloping from the high plains of its western boundary to the low wetlands of its southeastern boundary. Its highest and lowest points follow this trend, with its highest peak, Black Mesa, at 4,973 feet (1,516 m) above sea level, situated near its far northwest corner in the Oklahoma Panhandle. The state's lowest point is on the Little River near its far southeastern boundary near the town of Idabel, which dips to 289 feet (88 m) above sea level. Among the most geographically diverse states, Oklahoma is one of four to harbor more than 10 distinct ecological regions, with 11 in its borders—more per square mile than in any other state. Its western and eastern halves, however, are marked by extreme differences in geographical diversity: Eastern Oklahoma touches eight ecological regions and its western half contains three. Although having fewer ecological regions Western Oklahoma contains many rare, relic species. Oklahoma has four primary mountain ranges: the Ouachita Mountains, the Arbuckle Mountains, the Wichita Mountains, and the Ozark Mountains. Contained within the U.S. Interior Highlands region, the Ozark and Ouachita Mountains are the only major mountainous region between the Rocky Mountains and the Appalachians. A portion of the Flint Hills stretches into north-central Oklahoma, and near the state's eastern border, The Oklahoma Tourism & Recreation Department regards Cavanal Hill as the world's tallest hill; at 1,999 feet (609 m), it fails their definition of a mountain by one foot. The semi-arid high plains in the state's northwestern corner harbor few natural forests; the region has a rolling to flat landscape with intermittent canyons and mesa ranges like the Glass Mountains. Partial plains interrupted by small, sky island mountain ranges like the Antelope Hills and the Wichita Mountains dot southwestern Oklahoma; transitional prairie and oak savannas cover the central portion of the state. The Ozark and Ouachita Mountains rise from west to east over the state's eastern third, gradually increasing in elevation in an eastward direction. More than 500 named creeks and rivers make up Oklahoma's waterways, and with 200 lakes created by dams, it holds the nation's highest number of artificial reservoirs. Most of the state lies in two primary drainage basins belonging to the Red and Arkansas rivers, though the Lee and Little rivers also contain significant drainage basins. Due to Oklahoma's location at the confluence of many geographic regions, the state's climatic regions have a high rate of biodiversity. Forests cover 24 percent of Oklahoma and prairie grasslands composed of shortgrass, mixed-grass, and tallgrass prairie, harbor expansive ecosystems in the state's central and western portions, although cropland has largely replaced native grasses. Where rainfall is sparse in the state's western regions, shortgrass prairie and shrublands are the most prominent ecosystems, though pinyon pines, red cedar (junipers), and ponderosa pines grow near rivers and creek beds in the panhandle's far western reaches. Southwestern Oklahoma contains many rare, disjunct species including sugar maple, bigtooth maple, nolina and southern live oak. Marshlands, cypress forests and mixtures of shortleaf pine, loblolly pine, blue palmetto, and deciduous forests dominate the state's southeastern quarter, while mixtures of largely post oak, elm, red cedar (Juniperus virginiana) and pine forests cover northeastern Oklahoma. The state holds populations of white-tailed deer, mule deer, antelope, coyotes, mountain lions, bobcats, elk, and birds such as quail, doves, cardinals, bald eagles, red-tailed hawks, and pheasants. In prairie ecosystems, American bison, greater prairie chickens, badgers, and armadillo are common, and some of the nation's largest prairie dog towns inhabit shortgrass prairie in the state's panhandle. The Cross Timbers, a region transitioning from prairie to woodlands in Central Oklahoma, harbors 351 vertebrate species. The Ouachita Mountains are home to black bear, red fox, gray fox, and river otter populations, which coexist with 328 vertebrate species in southeastern Oklahoma. Also, in southeastern Oklahoma lives the American alligator. Oklahoma has 50 state parks, six national parks or protected regions, two national protected forests or grasslands, and a network of wildlife preserves and conservation areas. Six percent of the state's 10 million acres (40,000 km2) of forest is public land, including the western portions of the Ouachita National Forest, the largest and oldest national forest in the Southern United States. With 39,000 acres (160 km2), the Tallgrass Prairie Preserve in north-central Oklahoma is the largest protected area of tallgrass prairie in the world and is part of an ecosystem that encompasses only 10 percent of its former land area, once covering 14 states. In addition, the Black Kettle National Grassland covers 31,300 acres (127 km2) of prairie in southwestern Oklahoma. The Wichita Mountains Wildlife Refuge is the oldest and largest of nine national wildlife refuges in the state and was founded in 1901, encompassing 59,020 acres (238.8 km2). Of Oklahoma's federally protected parks or recreational sites, the Chickasaw National Recreation Area is the largest, with 9,898.63 acres (40.0583 km2). Other sites include the Santa Fe and Trail of Tears national historic trails, the Fort Smith and Washita Battlefield national historic sites, and the Oklahoma City National Memorial. Oklahoma is in a humid subtropical region. Oklahoma lies in a transition zone between humid continental climate to the north, semi-arid climate to the west, and humid subtropical climate in the central, south and eastern portions of the state. Most of the state lies in an area known as Tornado Alley characterized by frequent interaction between cold, dry air from Canada, warm to hot, dry air from Mexico and the Southwestern U.S., and warm, moist air from the Gulf of Mexico. The interactions between these three contrasting air currents produces severe weather (severe thunderstorms, damaging thunderstorm winds, large hail and tornadoes) with a frequency virtually unseen anywhere else on planet Earth. An average 62 tornadoes strike the state per year—one of the highest rates in the world. Because of Oklahoma's position between zones of differing prevailing temperature and winds, weather patterns within the state can vary widely over relatively short distances and can change drastically in a short time. As an example, on November 11, 1911, the temperature at Oklahoma City reached 83 °F (28 °C) in the afternoon (the record high for that date), then an Arctic cold front of unprecedented intensity slammed across the state, causing the temperature to fall 66 degrees, down to 17 °F (−8 °C) at midnight (the record low for that date); thus, both the record high and record low for November 11 were set on the same date. This type of phenomenon is also responsible for many of the tornadoes in the area, such as the 1912 Oklahoma tornado outbreak, when a warm front traveled along a stalled cold front, resulting in an average of about one tornado per hour over the course of a day. The humid subtropical climate (Koppen Cfa) of central, southern and eastern Oklahoma is influenced heavily by southerly winds bringing moisture from the Gulf of Mexico. Traveling westward, the climate transitions progressively toward a semi-arid zone (Koppen BSk) in the high plains of the Panhandle and other western areas from about Lawton westward, less frequently touched by southern moisture. Precipitation and temperatures decline from east to west accordingly, with areas in the southeast averaging an annual temperature of 62 °F (17 °C) and an annual rainfall of generally over 40 inches (1,020 mm) and up to 56 inches (1,420 mm), while areas of the (higher-elevation) panhandle average 58 °F (14 °C), with an annual rainfall under 17 inches (430 mm). Over almost all of Oklahoma, winter is the driest season. Average monthly precipitation increases dramatically in the spring to a peak in May, the wettest month over most of the state, with its frequent and not uncommonly severe thunderstorm activity. Early June can still be wet, but most years see a marked decrease in rainfall during June and early July. Mid-summer (July and August) represents a secondary dry season over much of Oklahoma, with long stretches of hot weather with only sporadic thunderstorm activity not uncommon many years. Severe drought is common in the hottest summers, such as those of 1934, 1954, 1980 and 2011, all of which featured weeks on end of virtual rainlessness and high temperatures well over 100 °F (38 °C). Average precipitation rises again from September to mid-October, representing a secondary wetter season, then declines from late October through December. All of the state frequently experiences temperatures above 100 °F (38 °C) or below 0 °F (−18 °C), though below-zero temperatures are rare in south-central and southeastern Oklahoma. Snowfall ranges from an average of less than 4 inches (10 cm) in the south to just over 20 inches (51 cm) on the border of Colorado in the panhandle. The state is home to the Storm Prediction Center, the National Severe Storms Laboratory, and the Warning Decision Training Division, all part of the National Weather Service and in Norman. Oklahoma's highest-recorded temperature of 120 °F (49 °C) was recorded at Tipton on June 27, 1994 and the lowest recorded temperature of −31 °F (−35 °C) was recorded at Nowata on February 10, 2011. Map of Indian Territory (Oklahoma) 1889. Britannica 9th edition. Evidence suggests indigenous peoples traveled through Oklahoma as early as the last ice age. Ancestors of the Wichita, Kichai, Teyas, Escanjaques, and Caddo lived in what is now Oklahoma. Southern Plains villagers lived in the central and west of the state, with a subgroup, the Panhandle culture people living in panhandle region. Caddoan Mississippian culture peoples lived in the eastern part of the state. Spiro Mounds, in what is now Spiro, Oklahoma, was a major Mississippian mound complex that flourished between AD 850 and 1450. The Spaniard Francisco Vázquez de Coronado traveled through the state in 1541, but French explorers claimed the area in the 1700s. In the 18th century, Kiowa, Apache, and Comanche entered the region from the west and Quapaw and Osage peoples moved into what is now eastern Oklahoma. French colonists claimed the region until 1803, when all the French territory west of the Mississippi River was purchased by the United States in the Louisiana Purchase. The territory now known as Oklahoma was first a part of the Arkansas Territory from 1819 until 1828. During the 19th century, thousands of Native Americans were expelled from their ancestral homelands from across North America and transported to the area including and surrounding present-day Oklahoma. The Choctaw was the first of the Five Civilized Tribes to be removed from the Southeastern United States. The phrase "Trail of Tears" originated from a description of the removal of the Choctaw Nation in 1831, although the term is usually used for the Cherokee removal. Seventeen thousand Cherokees and 2,000 of their black slaves were deported. The area, already occupied by Osage and Quapaw tribes, was called for the Choctaw Nation until revised Native American and then later American policy redefined the boundaries to include other Native Americans. By 1890, more than 30 Native American nations and tribes had been concentrated on land within Indian Territory or "Indian Country". All Five Civilized Tribes supported and signed treaties with the Confederate military during the American Civil War. The Cherokee Nation had an internal civil war. Slavery in Indian Territory was not abolished until 1866. In the period between 1866 and 1899, cattle ranches in Texas strove to meet the demands for food in eastern cities and railroads in Kansas promised to deliver in a timely manner. Cattle trails and cattle ranches developed as cowboys either drove their product north or settled illegally in Indian Territory. In 1881, four of five major cattle trails on the western frontier traveled through Indian Territory. Increased presence of white settlers in Indian Territory prompted the United States Government to establish the Dawes Act in 1887, which divided the lands of individual tribes into allotments for individual families, encouraging farming and private land ownership among Native Americans but expropriating land to the federal government. In the process, railroad companies took nearly half of Indian-held land within the territory for outside settlers and for purchase. Major land runs, including the Land Run of 1889, were held for settlers where certain territories were opened to settlement starting at a precise time. Usually land was open to settlers on a first come first served basis. Those who broke the rules by crossing the border into the territory before the official opening time were said to have been crossing the border sooner, leading to the term sooners, which eventually became the state's official nickname. Deliberations to make the territory into a state began near the end of the 19th century, when the Curtis Act continued the allotment of Indian tribal land. Attempts to create an all-Indian state named Oklahoma and a later attempt to create an all-Indian state named Sequoyah failed but the Sequoyah Statehood Convention of 1905 eventually laid the groundwork for the Oklahoma Statehood Convention, which took place two years later. On June 16, 1906, Congress enacted a statute authorizing the people of the Oklahoma and Indian Territories (as well what would become the states of Arizona and New Mexico) to form a constitution and state government in order to be admitted as a state. On November 16, 1907, President Theodore Roosevelt issued Presidential Proclamation no. 780, establishing Oklahoma as the 46th state in the Union. The new state became a focal point for the emerging oil industry, as discoveries of oil pools prompted towns to grow rapidly in population and wealth. Tulsa eventually became known as the "Oil Capital of the World" for most of the 20th century and oil investments fueled much of the state's early economy. In 1927, Oklahoman businessman Cyrus Avery, known as the "Father of Route 66", began the campaign to create U.S. Route 66. Using a stretch of highway from Amarillo, Texas to Tulsa, Oklahoma to form the original portion of Highway 66, Avery spearheaded the creation of the U.S. Highway 66 Association to oversee the planning of Route 66, based in his hometown of Tulsa. Oklahoma also has a rich African-American history. Many black towns thrived in the early 20th century because of black settlers moving from neighboring states, especially Kansas. The politician Edward P. McCabe encouraged black settlers to come to what was then Indian Territory. He discussed with President Theodore Roosevelt the possibility of making Oklahoma a majority-black state. By the early 20th century, the Greenwood neighborhood of Tulsa was one of the most prosperous African-American communities in the United States. Jim Crow laws had established racial segregation since before the start of the 20th century, but the blacks had created a thriving area. Social tensions were exacerbated by the revival of the Ku Klux Klan after 1915. The Tulsa Race Riot broke out in 1921, with whites attacking blacks. In one of the costliest episodes of racial violence in American history, sixteen hours of rioting resulted in 35 city blocks destroyed, $1.8 million in property damage, and a death toll estimated to be as high as 300 people. By the late 1920s, the Ku Klux Klan had declined to negligible influence within the state. During the 1930s, parts of the state began suffering the consequences of poor farming practice. This period was known as the Dust Bowl, throughout which areas of Kansas, Texas, New Mexico and northwestern Oklahoma were hampered by long periods of little rainfall, strong winds, and abnormally high temperatures, sending thousands of farmers into poverty and forcing them to relocate to more fertile areas of the western United States. Over a twenty-year period ending in 1950, the state saw its only historical decline in population, dropping 6.9 percent as impoverished families migrated out of the state after the Dust Bowl. Soil and water conservation projects markedly changed practices in the state and led to the construction of massive flood control systems and dams; they built hundreds of reservoirs and man-made lakes to supply water for domestic needs and agricultural irrigation. By the 1960s, Oklahoma had created more than 200 lakes, the most in the nation. In 1995, Oklahoma City was the site of one of the most destructive acts of domestic terrorism in American history. The Oklahoma City bombing of April 19, 1995, in which Timothy McVeigh detonated a large, crude explosive device outside the Alfred P. Murrah Federal Building, killed 168 people, including 19 children. For his crime, McVeigh was executed by the federal government on June 11, 2001. His accomplice, Terry Nichols, is serving life in prison without parole for helping plan the attack and prepare the explosive. On May 31, 2016, several cities experienced record setting flooding. The United States Census Bureau estimates Oklahoma's population was 3,943,079 on July 1, 2018, a 5.11% increase since the 2010 United States Census. At the 2010 Census, 68.7% of the population was non-Hispanic white, down from 88% in 1970, 7.3% non-Hispanic Black or African American, 8.2% non-Hispanic American Indian and Alaska Native, 1.7% non-Hispanic Asian, 0.1% non-Hispanic Native Hawaiian and Other Pacific Islander, 0.1% from some other race (non-Hispanic) and 5.1% of two or more races (non-Hispanic). 8.9% of Oklahoma's population was of Hispanic, Latino, or Spanish origin (they may be of any race). As of 2011[update], 47.3% of Oklahoma's population younger than age 1 were minorities, meaning they had at least one parent who was not non-Hispanic white. As of 2005[update] Oklahoma's estimated ancestral makeup was 14.5% German, 13.1% American, 11.8% Irish, 9.6% English, 8.1% African American, and 11.4% Native American (including 7.9% Cherokee) though the percentage of people claiming American Indian as their only race was 8.1%. Most people from Oklahoma who self-identify as having American ancestry are of overwhelmingly English ancestry with significant amounts of Scottish and Welsh inflection as well. The state had the second-highest number of Native Americans in 2002, estimated at 395,219, as well as the second-highest percentage among all states. In 2011, U.S. Census Bureau American Community Survey data from 2005–2009 indicated about 5% of Oklahoma's residents were born outside the United States. This is lower than the national figure (about 12.5% of U.S. residents were foreign-born). The center of population of Oklahoma is in Lincoln County near the town of Sparks. The state's 2006 per capita personal income ranked 37th at $32,210, though it has the third-fastest-growing per capita income in the nation and ranks consistently among the lowest states in cost of living index. The Oklahoma City suburb Nichols Hills is first on Oklahoma locations by per capita income at $73,661, though Tulsa County holds the highest average. In 2011, 7.0% of Oklahomans were under the age of 5, 24.7% under 18, and 13.7% were 65 or older. Females made up 50.5% of the population. The state is in the U.S. Census' Southern region. According to the 2010 United States Census, Oklahoma is the 28th-most populous state with 3,751,616 inhabitants but the 19th-largest by land area spanning 68,594.92 square miles (177,660.0 km2) of land. Oklahoma is divided into 77 counties and contains 597 incorporated municipalities consisting of cities and towns. In Oklahoma, cities are all those incorporated communities which are 1,000 or more in population and are incorporated as cities. Towns are limited to town board type of municipal government. Cities may choose among aldermanic, mayoral, council-manager, and home-rule charter types of government. Cities may also petition to incorporate as towns. The English language has been official in the state of Oklahoma since 2010. The variety of North American English spoken is called Oklahoma English, and this dialect is quite diverse with its uneven blending of features of North Midland, South Midland, and Southern dialects. In 2000, 2,977,187 Oklahomans—92.6% of the resident population five years or older—spoke only English at home, a decrease from 95% in 1990. 238,732 Oklahoma residents reported speaking a language other than English in the 2000 census, about 7.4% of the state's population. Spanish is the second-most commonly spoken language in the state, with 141,060 speakers counted in 2000. The two most commonly spoken native North American languages are Cherokee and Choctaw with 10,000 Cherokee speakers living within the Cherokee Nation tribal jurisdiction area of eastern Oklahoma, and another 10,000 Choctaw speakers living in the Choctaw Nation directly south of the Cherokees. Cherokee is an official language in the Cherokee Nation tribal jurisdiction area and in the United Keetoowah Band of Cherokee Indians. German has 13,444 speakers representing about 0.4% of the state's population, and Vietnamese is spoken by 11,330 people, or about 0.4% of the population, many of whom live in the Asia District of Oklahoma City. Other languages include French with 8,258 speakers (0.3%), Chinese with 6,413 (0.2%), Korean with 3,948 (0.1%), Arabic with 3,265 (0.1%), other Asian languages with 3,134 (0.1%), Tagalog with 2,888 (0.1%), Japanese with 2,546 (0.1%), and African languages with 2,546 (0.1%). In addition to Cherokee, more than 25 Native American languages are spoken in Oklahoma, second only to California (though, it should be noted only Cherokee exhibits language vitality at present). Oklahoma is part of a geographical region characterized by conservative and Evangelical Christianity known as the "Bible Belt". Spanning the southern and eastern parts of the United States, the area is known for politically and socially conservative views, with the Republican Party having the greater number of voters registered between the two parties. 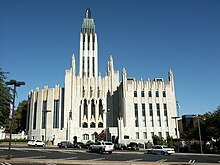 Tulsa, the state's second-largest city, home to Oral Roberts University, is sometimes called the "buckle of the Bible Belt". According to the Pew Research Center, the majority of Oklahoma's religious adherents are Christian, accounting for about 80 percent of the population. 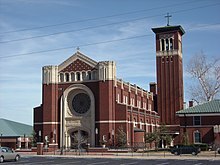 The percentage of Oklahomans affiliated with Catholicism is half of the national average, while the percentage affiliated with Evangelical Protestantism is more than twice the national average – tied with Arkansas for the largest percentage of any state. In 2010, the state's largest church memberships were in the Southern Baptist Convention (886,394 members), the United Methodist Church (282,347), the Roman Catholic Church (178,430), and the Assemblies of God (85,926) and The Church of Jesus Christ of Latter-Day Saints (47,349). Other religions represented in the state include Buddhism, Hinduism, and Islam. In 2000, there were about 5,000 Jews and 6,000 Muslims, with 10 congregations to each group. Oklahoma has been described as "the world's prison capital", with 1,079 of every 100,000 residents imprisoned in 2018, the highest incarceration rate of any state, and by comparison, higher than the incarceration rates of any country in the world. Oklahoma is host to a diverse range of sectors including aviation, energy, transportation equipment, food processing, electronics, and telecommunications. Oklahoma is an important producer of natural gas, aircraft, and food. The state ranks third in the nation for production of natural gas, is the 27th-most agriculturally productive state, and also ranks 5th in production of wheat. Four Fortune 500 companies and six Fortune 1000 companies are headquartered in Oklahoma, and it has been rated one of the most business-friendly states in the nation, with the 7th-lowest tax burden in 2007. In 2010, Oklahoma City-based Love's Travel Stops & Country Stores ranked 18th on the Forbes list of largest private companies, Tulsa-based QuikTrip ranked 37th, and Oklahoma City-based Hobby Lobby ranked 198th in 2010 report. Oklahoma's gross domestic product grew from $131.9 billion in 2006 to $147.5 billion in 2010, a jump of 10.6 percent. Oklahoma's gross domestic product per capita was $35,480 in 2010, which was ranked 40th among the states. Though oil has historically dominated the state's economy, a collapse in the energy industry during the 1980s led to the loss of nearly 90,000 energy-related jobs between 1980 and 2000, severely damaging the local economy. 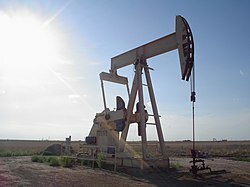 Oil accounted for 35 billion dollars in Oklahoma's economy in 2007, and employment in the state's oil industry was outpaced by five other industries in 2007. As of July 2017[update], the state's unemployment rate is 4.4%. In mid-2011, Oklahoma had a civilian labor force of 1.7 million and non-farm employment fluctuated around 1.5 million. The government sector provides the most jobs, with 339,300 in 2011, followed by the transportation and utilities sector, providing 279,500 jobs, and the sectors of education, business, and manufacturing, providing 207,800, 177,400, and 132,700 jobs, respectively. Among the state's largest industries, the aerospace sector generates $11 billion annually. Tulsa is home to the largest airline maintenance base in the world, which serves as the global maintenance and engineering headquarters for American Airlines. In total, aerospace accounts for more than 10 percent of Oklahoma's industrial output, and it is one of the top 10 states in aerospace engine manufacturing. Because of its position in the center of the United States, Oklahoma is also among the top states for logistic centers, and a major contributor to weather-related research. The state is the top manufacturer of tires in North America and contains one of the fastest-growing biotechnology industries in the nation. In 2005, international exports from Oklahoma's manufacturing industry totaled $4.3 billion, accounting for 3.6 percent of its economic impact. Tire manufacturing, meat processing, oil and gas equipment manufacturing, and air conditioner manufacturing are the state's largest manufacturing industries. Oklahoma is the nation's third-largest producer of natural gas, and its fifth-largest producer of crude oil. The state also has the second-greatest number of active drilling rigs, and it is even ranked fifth in crude oil reserves. While the state is ranked eighth for installed wind energy capacity in 2011, it is at the bottom of states in usage of renewable energy, with 94% of its electricity being generated by non-renewable sources in 2009, including 25% from coal and 46% from natural gas. Oklahoma has no nuclear power. Ranking 13th for total energy consumption per capita in 2009, The state's energy costs were eighth-lowest in the nation. As a whole, the oil energy industry contributes $35 billion to Oklahoma's gross domestic product (GDP), and employees of the state's oil-related companies earn an average of twice the state's typical yearly income. In 2009, the state had 83,700 commercial oil wells churning 65.374 million barrels (10,393,600 m3) of crude oil. Eight and a half percent of the nation's natural gas supply is held in Oklahoma, with 1.673 trillion cubic feet (47.4 km3) being produced in 2009. The Oklahoma Stack Play is a geographic referenced area in the Anadarko Basin. The oil field "Sooner Trend", Anadarko basin and the counties of Kingfisher and Canadian make up the basis for the "Oklahoma STACK". Other Plays such as the Eagle Ford are geological rather than geographical. According to Forbes magazine, Oklahoma City-based Devon Energy Corporation, Chesapeake Energy Corporation, and SandRidge Energy Corporation are the largest private oil-related companies in the nation, and all of Oklahoma's Fortune 500 companies are energy-related. Tulsa's ONEOK and Williams Companies are the state's largest and second-largest companies respectively, also ranking as the nation's second- and third-largest companies in the field of energy, according to Fortune magazine. The magazine also placed Devon Energy as the second-largest company in the mining and crude oil-producing industry in the nation, while Chesapeake Energy ranks seventh respectively in that sector and Oklahoma Gas & Electric ranks as the 25th-largest gas and electric utility company. Oklahoma Gas & Electric, commonly referred to as OG&E (NYSE: OGE) operates four base electric power plants in Oklahoma. Two of them are coal-fired power plants: one in Muskogee, and the other in Red Rock. Two are gas-fired power plants: one in Harrah and the other in Konawa. OG&E was the first electric company in Oklahoma to generate electricity from wind farms in 2003. The 27th-most agriculturally productive state, Oklahoma is fifth in cattle production and fifth in production of wheat. Approximately 5.5 percent of American beef comes from Oklahoma, while the state produces 6.1 percent of American wheat, 4.2 percent of American pig products, and 2.2 percent of dairy products. The state had 85,500 farms in 2012, collectively producing $4.3 billion in animal products and fewer than one billion dollars in crop output with more than $6.1 billion added to the state's gross domestic product. Poultry and swine are its second- and third-largest agricultural industries. With an educational system made up of public school districts and independent private institutions, Oklahoma had 638,817 students enrolled in 1,845 public primary, secondary, and vocational schools in 533 school districts as of 2008[update]. Oklahoma has the highest enrollment of Native American students in the nation with 126,078 students in the 2009–10 school year. Oklahoma spent $7,755 for each student in 2008, and was 47th in the nation in expenditures per student, though its growth of total education expenditures between 1992 and 2002 ranked 22nd. The state is among the best in pre-kindergarten education, and the National Institute for Early Education Research rated it first in the United States with regard to standards, quality, and access to pre-kindergarten education in 2004, calling it a model for early childhood schooling. High school dropout rate decreased from 3.1 to 2.5 percent between 2007 and 2008 with Oklahoma ranked among 18 other states with 3 percent or less dropout rate. In 2004, the state ranked 36th in the nation for the relative number of adults with high school diplomas, though at 85.2 percent, it had the highest rate among Southern states. According to a study conducted by the Pell Institute, Oklahoma ranks 48th in college-participation for low-income students. The University of Oklahoma, Oklahoma State University, the University of Central Oklahoma, and Northeastern State University are the largest public institutions of higher education in Oklahoma, operating through one primary campus and satellite campuses throughout the state. The two state universities, along with Oklahoma City University and the University of Tulsa, rank among the country's best in undergraduate business programs. Oklahoma City University School of Law, University of Oklahoma College of Law, and University of Tulsa College of Law are the state's only ABA accredited institutions. Both University of Oklahoma and University of Tulsa are Tier 1 institutions, with the University of Oklahoma ranked 68th and the University of Tulsa ranked 86th in the nation. Oklahoma holds eleven public regional universities, including Northeastern State University, the second-oldest institution of higher education west of the Mississippi River, also containing the only College of Optometry in Oklahoma and the largest enrollment of Native American students in the nation by percentage and amount. Langston University is Oklahoma's only historically black college. Six of the state's universities were placed in the Princeton Review's list of best 122 regional colleges in 2007, and three made the list of top colleges for best value. The state has 55 post-secondary technical institutions operated by Oklahoma's CareerTech program for training in specific fields of industry or trade. In the 2007–2008 school year, there were 181,973 undergraduate students, 20,014 graduate students, and 4,395 first-professional degree students enrolled in Oklahoma colleges. Of these students, 18,892 received a bachelor's degree, 5,386 received a master's degree, and 462 received a first professional degree. This means the state of Oklahoma produces an average of 38,278 degree-holders per completions component (i.e. July 1, 2007 – June 30, 2008). National average is 68,322 total degrees awarded per completions component. Beginning on April 2, 2018, tens of thousands of K–12 public school teachers went on strike due to lack of funding. According to the National Education Association, teachers in Oklahoma had ranked 49th out of the 50 states in terms of teacher pay in 2016. The Oklahoma Legislature had passed a measure a week earlier to raise teacher salaries by $6,100, but it fell short of the $10,000 raise for teachers, $5,000 raise for other school employees, and $200 million increase in extra education funding many had sought. The Cherokee Nation instigated a 10-year language preservation plan that involved growing new fluent speakers of the Cherokee language from childhood on up through school immersion programs as well as a collaborative community effort to continue to use the language at home. This plan was part of an ambitious goal that in 50 years, 80% or more of the Cherokee people will be fluent in the language. The Cherokee Preservation Foundation has invested $3 million into opening schools, training teachers, and developing curricula for language education, as well as initiating community gatherings where the language can be actively used. 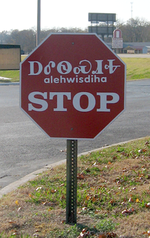 A Cherokee language immersion school in Tahlequah, Oklahoma educates students from pre-school through eighth grade. Oklahoma is placed in the South by the United States Census Bureau, but lies partially in the, Southwest, and Southern cultural regions by varying definitions, and partially in the Upland South and Great Plains by definitions of abstract geographical-cultural regions. Oklahomans have a high rate of English, Scotch-Irish, German, and Native American ancestry, with 25 different native languages spoken. Because many Native Americans were forced to move to Oklahoma when White settlement in North America increased, Oklahoma has much linguistic diversity. Mary Linn, an associate professor of anthropology at the University of Oklahoma and the associate curator of Native American languages at the Sam Noble Museum, notes Oklahoma also has high levels of language endangerment. Sixty-seven Native American tribes are represented in Oklahoma, including 39 federally recognized tribes, who are headquartered and have tribal jurisdictional areas in the state. Western ranchers, Native American tribes, Southern settlers, and eastern oil barons have shaped the state's cultural predisposition, and its largest cities have been named among the most underrated cultural destinations in the United States. Residents of Oklahoma are associated with traits of Southern hospitality—the 2006 Catalogue for Philanthropy (with data from 2004) ranks Oklahomans 7th in the nation for overall generosity. The state has also been associated with a negative cultural stereotype first popularized by John Steinbeck's novel The Grapes of Wrath, which described the plight of uneducated, poverty-stricken Dust Bowl-era farmers deemed "Okies". However, the term is often used in a positive manner by Oklahomans. In the state's largest urban areas, pockets of jazz culture flourish, and Native American, Mexican American, and Asian American communities produce music and art of their respective cultures. The Oklahoma Mozart Festival in Bartlesville is one of the largest classical music festivals on the southern plains, and Oklahoma City's Festival of the Arts has been named one of the top fine arts festivals in the nation. The state has a rich history in ballet with five Native American ballerinas attaining worldwide fame. These were Yvonne Chouteau, sisters Marjorie and Maria Tallchief, Rosella Hightower and Moscelyne Larkin, known collectively as the Five Moons. The New York Times rates the Tulsa Ballet as one of the top ballet companies in the United States. The Oklahoma City Ballet and University of Oklahoma's dance program were formed by ballerina Yvonne Chouteau and husband Miguel Terekhov. The University program was founded in 1962 and was the first fully accredited program of its kind in the United States. In Sand Springs, an outdoor amphitheater called "Discoveryland!" is the official performance headquarters for the musical Oklahoma! Ridge Bond, native of McAlester, Oklahoma, starred in the Broadway and International touring productions of Oklahoma!, playing the role of "Curly McClain" in more than 2,600 performances. In 1953 he was featured along with the Oklahoma! cast on a CBS Omnibus television broadcast. Bond was instrumental in the Oklahoma! title song becoming the Oklahoma state song and is also featured on the U.S. postage stamp commemorating the musical's 50th anniversary. Historically, the state has produced musical styles such as The Tulsa Sound and western swing, which was popularized at Cain's Ballroom in Tulsa. The building, known as the "Carnegie Hall of Western Swing", served as the performance headquarters of Bob Wills and the Texas Playboys during the 1930s. Stillwater is known as the epicenter of Red Dirt music, the best-known proponent of which is the late Bob Childers. Prominent theatre companies in Oklahoma include, in the capital city, Oklahoma City Theatre Company, Carpenter Square Theatre, Oklahoma Shakespeare in the Park, and CityRep. CityRep is a professional company affording equity points to those performers and technical theatre professionals. In Tulsa, Oklahoma's oldest resident professional company is American Theatre Company, and Theatre Tulsa is the oldest community theatre company west of the Mississippi. Other companies in Tulsa include Heller Theatre and Tulsa Spotlight Theater. The cities of Norman, Lawton, and Stillwater, among others, also host well-reviewed community theatre companies. Oklahoma is in the nation's middle percentile in per capita spending on the arts, ranking 17th, and contains more than 300 museums. The Philbrook Museum of Tulsa is considered one of the top 50 fine art museums in the United States, and the Sam Noble Oklahoma Museum of Natural History in Norman, one of the largest university-based art and history museums in the country, documents the natural history of the region. The collections of Thomas Gilcrease are housed in the Gilcrease Museum of Tulsa, which also holds the world's largest, most comprehensive collection of art and artifacts of the American West. The Egyptian art collection at the Mabee-Gerrer Museum of Art in Shawnee is considered to be the finest Egyptian collection between Chicago and Los Angeles. The Oklahoma City Museum of Art contains the most comprehensive collection of glass sculptures by artist Dale Chihuly in the world, and Oklahoma City's National Cowboy & Western Heritage Museum documents the heritage of the American Western frontier. With remnants of the Holocaust and artifacts relevant to Judaism, the Sherwin Miller Museum of Jewish Art of Tulsa preserves the largest collection of Jewish art in the Southwest United States. Oklahoma's centennial celebration was named the top event in the United States for 2007 by the American Bus Association, and consisted of multiple celebrations saving with the 100th anniversary of statehood on November 16, 2007. Annual ethnic festivals and events take place throughout the state such as Native American powwows and ceremonial events, and include festivals (as examples) in Scottish, Irish, German, Italian, Vietnamese, Chinese, Czech, Jewish, Arab, Mexican and African-American communities depicting cultural heritage or traditions. During a ten-day run in Oklahoma City, the State Fair of Oklahoma attracts roughly one million people along with the annual Festival of the Arts. Large national pow wows, various Latin and Asian heritage festivals, and cultural festivals such as the Juneteenth celebrations are held in Oklahoma City each year. The Tulsa State Fair attracts over one million people during its 10-day run, and the city's Mayfest festival entertained more than 375,000 people in four days during 2007. In 2006, Tulsa's Oktoberfest was named one of the top 10 in the world by USA Today and one of the top German food festivals in the nation by Bon Appétit magazine. Norman plays host to the Norman Music Festival, a festival that highlights native Oklahoma bands and musicians. Norman is also host to the Medieval Fair of Norman, which has been held annually since 1976 and was Oklahoma's first medieval fair. The Fair was held first on the south oval of the University of Oklahoma campus and in the third year moved to the Duck Pond in Norman until the Fair became too big and moved to Reaves Park in 2003. The Medieval Fair of Norman is Oklahoma's "largest weekend event and the third-largest event in Oklahoma, and was selected by Events Media Network as one of the top 100 events in the nation". Oklahoma has teams in basketball, football, arena football, baseball, soccer, hockey, and wrestling in Oklahoma City, Tulsa, Enid, Norman, and Lawton. The Oklahoma City Thunder of the National Basketball Association (NBA) is the state's only major league sports franchise. The state had a team in the Women's National Basketball Association, the Tulsa Shock, from 2010 through 2015, but the team relocated to Dallas–Fort Worth after that season and became the Dallas Wings. Oklahoma has teams in several minor leagues, including Minor League Baseball at the AAA and AA levels (Oklahoma City Dodgers and Tulsa Drillers, respectively), hockey's ECHL with the Tulsa Oilers, and a number of indoor football leagues. In the last-named sport, the state's most notable team was the Tulsa Talons, which played in the Arena Football League until 2012, when the team was moved to San Antonio. The Oklahoma Defenders replaced the Talons as Tulsa's only professional arena football team, playing the CPIFL. The Oklahoma City Blue, of the NBA G League, relocated to Oklahoma City from Tulsa in 2014, where they were formerly known as the Tulsa 66ers. Tulsa is the base for the Tulsa Revolution, which plays in the American Indoor Soccer League. Enid and Lawton host professional basketball teams in the USBL and the CBA. The NBA's New Orleans Hornets became the first major league sports franchise based in Oklahoma when the team was forced to relocate to Oklahoma City's Ford Center, now known as Chesapeake Energy Arena, for two seasons following Hurricane Katrina in 2005. In July 2008, the Seattle SuperSonics, relocated to Oklahoma City and began to play at the Ford Center as the Oklahoma City Thunder for the 2008–09 season, becoming the state's first permanent major league franchise. Collegiate athletics are a popular draw in the state. The state has four schools that compete at the highest level of college sports, NCAA Division I. The most prominent are the state's two members of the Big 12 Conference, one of the so-called Power Five conferences of the top tier of college football, Division I FBS. The University of Oklahoma and Oklahoma State University average well over 50,000 fans attending their football games, and Oklahoma's football program ranked 12th in attendance among American colleges in 2010, with an average of 84,738 people attending its home games. The two universities meet several times each year in rivalry matches known as the Bedlam Series, which are some of the greatest sporting draws to the state. Sports Illustrated magazine rates Oklahoma and Oklahoma State among the top colleges for athletics in the nation. Two private institutions in Tulsa, the University of Tulsa and Oral Roberts University; are also Division I members. Tulsa competes in FBS football and other sports in the American Athletic Conference, while Oral Roberts, which does not sponsor football, is a member of the Summit League. In addition, 12 of the state's smaller colleges and universities compete in NCAA Division II as members of four different conferences, and eight other Oklahoma institutions participate in the NAIA, mostly within the Sooner Athletic Conference. Regular LPGA tournaments are held at Cedar Ridge Country Club in Tulsa, and major championships for the PGA or LPGA have been played at Southern Hills Country Club in Tulsa, Oak Tree Country Club in Oklahoma City, and Cedar Ridge Country Club in Tulsa. Rated one of the top golf courses in the nation, Southern Hills has hosted four PGA Championships, including one in 2007, and three U.S. Opens, the most recent in 2001. Rodeos are popular throughout the state, and Guymon, in the state's panhandle, hosts one of the largest in the nation. Oklahoma was the 21st-largest recipient of medical funding from the federal government in 2005, with health-related federal expenditures in the state totaling $75,801,364; immunizations, bioterrorism preparedness, and health education were the top three most funded medical items. Instances of major diseases are near the national average in Oklahoma, and the state ranks at or slightly above the rest of the country in percentage of people with asthma, diabetes, cancer, and hypertension. In 2000, Oklahoma ranked 45th in physicians per capita and slightly below the national average in nurses per capita, but was slightly over the national average in hospital beds per 100,000 people and above the national average in net growth of health services over a 12-year period. One of the worst states for percentage of insured people, nearly 25 percent of Oklahomans between the age of 18 and 64 did not have health insurance in 2005, the fifth-highest rate in the nation. Oklahomans are in the upper half of Americans in terms of obesity prevalence, and the state is the 5th most obese in the nation, with 30.3 percent of its population at or near obesity. Oklahoma ranked last among the 50 states in a 2007 study by the Commonwealth Fund on health care performance. The OU Medical Center, Oklahoma's largest collection of hospitals, is the only hospital in the state designated a Level I trauma center by the American College of Surgeons. OU Medical Center is on the grounds of the Oklahoma Health Center in Oklahoma City, the state's largest concentration of medical research facilities. The Cancer Treatment Centers of America at Southwestern Regional Medical Center in Tulsa is one of four such regional facilities nationwide, offering cancer treatment to the entire southwestern United States, and is one of the largest cancer treatment hospitals in the country. The largest osteopathic teaching facility in the nation, Oklahoma State University Medical Center at Tulsa, also rates as one of the largest facilities in the field of neuroscience. On June 26, 2018, Oklahoma made marijuana legal for medical purposes. This was a milestone for a state in the Bible Belt. Oklahoma City and Tulsa are the 45th- and 61st-largest media markets in the United States as ranked by Nielsen Media Research. The state's third-largest media market, Lawton-Wichita Falls, Texas, is ranked 149th nationally by the agency. Broadcast television in Oklahoma began in 1949 when KFOR-TV (then WKY-TV) in Oklahoma City and KOTV-TV in Tulsa began broadcasting a few months apart. Currently, all major American broadcast networks have affiliated television stations in the state. The state has two primary newspapers. The Oklahoman, based in Oklahoma City, is the largest newspaper in the state and 54th-largest in the nation by circulation, with a weekday readership of 138,493 and a Sunday readership of 202,690. The Tulsa World, the second-most widely circulated newspaper in Oklahoma and 79th in the nation, holds a Sunday circulation of 132,969 and a weekday readership of 93,558. Oklahoma's first newspaper was established in 1844, called the Cherokee Advocate, and was written in both Cherokee and English. In 2006, there were more than 220 newspapers in the state, including 177 with weekly publications and 48 with daily publications. The state's first radio station, WKY in Oklahoma City, signed on in 1920, followed by KRFU in Bristow, which later on moved to Tulsa and became KVOO in 1927. In 2006, there were more than 500 radio stations in Oklahoma broadcasting with various local or nationally owned networks. Five universities in Oklahoma operate non-commercial, public radio stations/networks. Oklahoma has a few ethnic-oriented TV stations broadcasting in Spanish and Asian languages, and there is some Native American programming. TBN, a Christian religious television network, has a studio in Tulsa, and built its first entirely TBN-owned affiliate in Oklahoma City in 1980. Transportation in Oklahoma is generated by an anchor system of Interstate Highways, inter-city rail lines, airports, inland ports, and mass transit networks. Situated along an integral point in the United States Interstate network, Oklahoma contains three primary Interstate highways and four auxiliary Interstate Highways. In Oklahoma City, Interstate 35 intersects with Interstate 44 and Interstate 40, forming one of the most important intersections along the United States highway system. More than 12,000 miles (19,000 km) of roads make up the state's major highway skeleton, including state-operated highways, ten turnpikes or major toll roads, and the longest drivable stretch of Route 66 in the nation. In 2008, Interstate 44 in Oklahoma City was Oklahoma's busiest highway, with a daily traffic volume of 123,300 cars. In 2010, the state had the nation's third-highest number of bridges classified as structurally deficient, with nearly 5,212 bridges in disrepair, including 235 National Highway System Bridges. Oklahoma's largest commercial airport is Will Rogers World Airport in Oklahoma City, averaging a yearly passenger count of more than 3.5 million (1.7 million boardings) in 2010. Tulsa International Airport, the state's second-largest commercial airport, served more than 1.3 million boardings in 2010. Between the two, six airlines operate in Oklahoma. In terms of traffic, R. L. Jones Jr. (Riverside) Airport in Tulsa is the state's busiest airport, with 335,826 takeoffs and landings in 2008. Oklahoma has over 150 public-use airports. Oklahoma is connected to the nation's rail network via Amtrak's Heartland Flyer, its only regional passenger rail line. It currently stretches from Oklahoma City to Fort Worth, Texas, though lawmakers began seeking funding in early 2007 to connect the Heartland Flyer to Tulsa. Two inland ports on rivers serve Oklahoma: the Port of Muskogee and the Tulsa Port of Catoosa. The state's only port handling international cargo, the Tulsa Port of Catoosa is the most inland ocean-going port in the nation and ships over two million tons of cargo each year. Both ports are on the McClellan–Kerr Arkansas River Navigation System, which connects barge traffic from Tulsa and Muskogee to the Mississippi River via the Verdigris and Arkansas rivers, contributing to one of the busiest waterways in the world. Oklahoma is a constitutional republic with a government modeled after the Federal government of the United States, with executive, legislative, and judicial branches. The state has 77 counties with jurisdiction over most local government functions within each respective domain, five congressional districts, and a voting base with a plurality in the Republican Party. State officials are elected by plurality voting in the state of Oklahoma. Oklahoma is one of 32 states with capital punishment as a legal sentence, and the state has had (between 1976 through mid-2011) the highest per capita execution rate in the US. 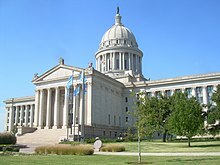 The Legislature of Oklahoma consists of the Senate and the House of Representatives. As the lawmaking branch of the state government, it is responsible for raising and distributing the money necessary to run the government. The Senate has 48 members serving four-year terms, while the House has 101 members with two-year terms. The state has a term limit for its legislature that restricts any one person to twelve cumulative years service between both legislative branches. Oklahoma's judicial branch consists of the Oklahoma Supreme Court, the Oklahoma Court of Criminal Appeals, and 77 District Courts that each serve one county. The Oklahoma judiciary also contains two independent courts: a Court of Impeachment and the Oklahoma Court on the Judiciary. Oklahoma has two courts of last resort: the state Supreme Court hears civil cases, and the state Court of Criminal Appeals hears criminal cases (this split system exists only in Oklahoma and neighboring Texas). Judges of those two courts, as well as the Court of Civil Appeals are appointed by the Governor upon the recommendation of the state Judicial Nominating Commission, and are subject to a non-partisan retention vote on a six-year rotating schedule. The executive branch consists of the Governor, their staff, and other elected officials. The principal head of government, the Governor is the chief executive of the Oklahoma executive branch, serving as the ex officio Commander-in-chief of the Oklahoma National Guard when not called into Federal use and reserving the power to veto bills passed through the Legislature. The responsibilities of the Executive branch include submitting the budget, ensuring state laws are enforced, and ensuring peace within the state is preserved. The state is divided into 77 counties that govern locally, each headed by a three-member council of elected commissioners, a tax assessor, clerk, court clerk, treasurer, and sheriff. While each municipality operates as a separate and independent local government with executive, legislative and judicial power, county governments maintain jurisdiction over both incorporated cities and non-incorporated areas within their boundaries, but have executive power but no legislative or judicial power. Both county and municipal governments collect taxes, employ a separate police force, hold elections, and operate emergency response services within their jurisdiction. Other local government units include school districts, technology center districts, community college districts, rural fire departments, rural water districts, and other special use districts. Thirty-nine Native American tribal governments are based in Oklahoma, each holding limited powers within designated areas. While Indian reservations typical in most of the United States are not present in Oklahoma, tribal governments hold land granted during the Indian Territory era, but with limited jurisdiction and no control over state governing bodies such as municipalities and counties. Tribal governments are recognized by the United States as quasi-sovereign entities with executive, judicial, and legislative powers over tribal members and functions, but are subject to the authority of the United States Congress to revoke or withhold certain powers. The tribal governments are required to submit a constitution and any subsequent amendments to the United States Congress for approval. Oklahoma has 11 substate districts including the two large Councils of Governments, INCOG in Tulsa (Indian Nations Council of Governments) and ACOG (Association of Central Oklahoma Governments). For a complete list visit the Oklahoma Association of Regional Councils. Oklahoma has been politically conservative for much of its history, especially recently. During the first half-century of statehood, it was considered a Democratic stronghold, being carried by the Republican Party in only two presidential elections (1920 and 1928). During this time, it was also carried by every winning Democratic candidate up to Harry Truman. However, Oklahoma Democrats were generally considered to be more conservative than Democrats in other states. After the 1948 election, the state turned firmly Republican. Although registered Republicans were a minority in the state until 2015, starting in 1952, Oklahoma has been carried by Republican presidential candidates in all but one election (1964). This is not to say every election has been a landslide for Republicans: Jimmy Carter lost the state by less than 1.5% in 1976, while Michael Dukakis and Bill Clinton both won 40% or more of the state's popular vote in 1988 and 1996 respectively. Al Gore in 2000, though, was the last Democrat to even win any counties in the state. Oklahoma was one of three states, the others being Utah and West Virginia, where Barack Obama failed to carry any of its counties in 2012, and it was the only state where Barack Obama failed to carry any county in 2008. In 2016, Donald Trump, the Republican nominee, again won every county, being one of only two states, the other being West Virginia, where Democrat Hillary Clinton failed to carry a single county. Generally, Republicans are strongest in the suburbs of Oklahoma City and Tulsa, as well as the Panhandle. Democrats are strongest in the eastern part of the state and Little Dixie, as well as the most heavily African American and inner parts of Oklahoma City and Tulsa. With a population of 8.6% Native American in the state, it is also worth noting most Native American precincts vote Democratic in margins exceeded only by African Americans. Following the 2000 census, the Oklahoma delegation to the U.S. House of Representatives was reduced from six to five representatives, each serving one congressional district. In the current Congress, all but one of Oklahoma's entire delegation are Republicans. Oklahoma City is the state's capital and largest city. Oklahoma had 598 incorporated places in 2010, including four cities over 100,000 in population and 43 over 10,000. Two of the fifty largest cities in the United States are in Oklahoma, Oklahoma City and Tulsa, and sixty-five percent of Oklahomans live within their metropolitan areas, or spheres of economic and social influence defined by the United States Census Bureau as a metropolitan statistical area. Oklahoma City, the state's capital and largest city, had the largest metropolitan area in the state in 2010, with 1,252,987 people, and the metropolitan area of Tulsa had 937,478 residents. Between 2000 and 2010, the cities that led the state in population growth were Blanchard (172.4%), Elgin (78.2%), Jenks (77.0%), Piedmont (56.7%), Bixby (56.6%), and Owasso (56.3%). Tulsa is the state's second-largest city by population and land area. In descending order of population, Oklahoma's largest cities in 2010 were: Oklahoma City (579,999, +14.6%), Tulsa (391,906, −0.3%), Norman (110,925, +15.9%), Broken Arrow (98,850, +32.0%), Lawton (96,867, +4.4%), Edmond (81,405, +19.2%), Moore (55,081, +33.9%), Midwest City (54,371, +0.5%), Enid (49,379, +5.0%), and Stillwater (45,688, +17.0%). Of the state's ten largest cities, three are outside the metropolitan areas of Oklahoma City and Tulsa, and only Lawton has a metropolitan statistical area of its own as designated by the United States Census Bureau, though the metropolitan statistical area of Fort Smith, Arkansas extends into the state. Under Oklahoma law, municipalities are divided into two categories: cities, defined as having more than 1,000 residents, and towns, with under 1,000 residents. Both have legislative, judicial, and public power within their boundaries, but cities can choose between a mayor–council, council–manager, or strong mayor form of government, while towns operate through an elected officer system. 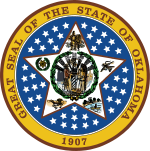 State law codifies Oklahoma's state emblems and honorary positions; the Oklahoma Senate or House of Representatives may adopt resolutions designating others for special events and to benefit organizations. In 2012 the House passed HCR 1024, which would change the state motto from "Labor Omnia Vincit" to "Oklahoma—In God We Trust!" The author of the resolution stated a constituent researched the Oklahoma Constitution and found no "official" vote regarding "Labor Omnia Vincit", therefore opening the door for an entirely new motto. A. ^ Determined by a survey by the Pew Research Center in 2008. Percentages represent claimed religious beliefs, not necessarily membership in any particular congregation. Figures have a ±5 percent margin of error. B. ^ Buddhism, Islam, Hinduism, Judaism, other faiths each account for less than 1 percent. Jehovah's Witnesses, Mormons, Orthodox Christianity, and other Christian traditions each compose less than half a percent. One percent refused to answer the Pew Research Center's survey. ^ a b "Keetoowah Cherokee is the Official Language of the UKB" (PDF). Keetoowah Cherokee News: Official Publication of the United Keetoowah Band of Cherokee Indians in Oklahoma. April 2009. Archived from the original (PDF) on July 15, 2014. Retrieved June 1, 2014. ^ a b "UKB Constitution and By-Laws in the Keetoowah Cherokee Language" (PDF). United Keetoowah Band of Cherokee Indians in Oklahoma. Archived from the original (PDF) on February 1, 2016. Retrieved July 6, 2017. ^ a b "The Cherokee Nation & its Language" (PDF). University of Minnesota: Center for Advanced Research on Language Acquisition. 2008. Retrieved May 22, 2014. ^ "Oklahoma State Amphibian - Bullfrog". State Symbols USA. Retrieved March 27, 2018. ^ a b "Oklahoma State Icons". Oklahoma Department of Libraries. Archived from the original on January 15, 2014. Retrieved May 11, 2007. ^ "Oklahoma State Fish - White Bass". State Symbols USA. Retrieved March 27, 2018. ^ "Oklahoma State Animal - Buffalo". State Symbols USA. Retrieved March 27, 2018. ^ "Oklahoma State Beverage - Milk". State Symbols USA. Retrieved March 27, 2018. ^ "Oklahoma State Dinosaur - Acrocanthosaurus atokensis". State Symbols USA. Retrieved March 27, 2018. ^ "Oklahoma State Fossil". State fossils. Archived from the original on February 20, 2007. Retrieved January 20, 2007. ^ "Oklahoma State Percussive Instrument - Drum". State Symbols USA. Retrieved March 27, 2018. ^ "Oklahoma State Cartoon Character - Gusty". State Symbols USA. Retrieved March 27, 2018. 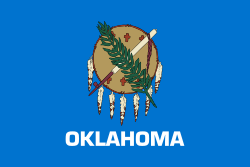 ^ "Oklahoma State Symbols and Emblems – Complete list of Oklahoma state symbols including the state flag and state seal from NETSTATE.COM". Netstate.com. Retrieved November 18, 2015. ^ "Watermelon State Vegetable". State Symbols USA. Retrieved June 3, 2016. ^ Matthew Weaver. "It's a scandal: Oklahoma declares watermelon a vegetable". the Guardian. ^ "Oklahoma State Game Bird - Wild Turkey". State Symbols USA. Retrieved March 27, 2018. ^ "Oklahoma State Monument - Golden Driller". State Symbols USA. Retrieved March 27, 2018. ^ John Benson, (April 28, 2009). "Flaming Lips prepare for Oklahoma honor". Reuters. ^ "Oklahoma State Theater Group - Lynn Riggs Players of Oklahoma". State Symbols USA. Retrieved March 27, 2018. ^ "New Oklahoma Quarter Launches into History". United States Mint. Retrieved February 9, 2008. ^ "Oklahoma". Dictionary.com. Retrieved August 10, 2007. ^ "Oklahoma, ᎣᎦᎳᎰᎹ". Cherokee-English Dictionary. Retrieved February 19, 2019. ^ "Chahta Okla, The Choctaw People". www.choctawnation.com. Retrieved February 19, 2019. ^ a b "Census Regions and Divisions of the United States" (PDF). United States Census Bureau. Retrieved July 2, 2016. ^ a b Wright, Muriel (June 1936). "Chronicles of Oklahoma". Oklahoma State University. Archived from the original on October 13, 2007. Retrieved July 31, 2007. ^ a b c "Oklahoma at a Glance" (PDF). Oklahoma Department of Commerce. Archived from the original (PDF) on August 8, 2007. Retrieved August 1, 2007. ^ "Annual Estimates of the Population of Metropolitan and Micropolitan Statistical Areas: April 1, 2000 to July 1, 2006". United States Census Bureau. Archived from the original (csv) on July 10, 2007. Retrieved September 15, 2007. ^ a b c d "Oklahoma, All Terrain Vacation". TravelOK. TravelOK.com. January 12, 2006. Archived from the original on July 9, 2006. Retrieved July 15, 2006. ^ a b c Greymorning, Stephen. "Profiles of Native American Education Programs". Southwest Educational Development Laboratory. Archived from the original on September 10, 2007. Retrieved August 4, 2007. ^ "Oklahoma State History and Information". A Look at Oklahoma. Oklahoma Department of Tourism and Recreation. 2007. Archived from the original on July 29, 2006. Retrieved June 7, 2006. ^ Merserve, John (1941). "Chief Allen Wright". Chronicles of Oklahoma. Archived from the original on May 7, 2006. Retrieved June 7, 2006. ^ ""River", Southband Pawnee". American Indian Studies Research Institute. Retrieved May 26, 2012. ^ "Cayuga: Our Oral Legacy". Cayuga Digital Dictionary. Archived from the original on March 26, 2012. Retrieved May 27, 2012. ^ "Dictionary of the Arapaho Language". studylib.net. Retrieved February 19, 2019. ^ "United States Summary: 2010, Population and Housing Unit Counts, 2010 Census of Population and Housing" (PDF). United States Census Bureau. September 2012. pp. V–2, 1 & 41 (Tables 1 & 18). Retrieved October 11, 2018. ^ "A Tapestry of Time and Terrain". United States Geological Survey. April 17, 2003. Archived from the original on May 15, 2006. Retrieved July 31, 2007. ^ a b "The Geography of Oklahoma". Netstate. July 31, 2007. Retrieved July 31, 2007. ^ a b c "Oklahoma State Map Collection". geology.com. 2006. Retrieved August 1, 2007. ^ a b c d e Arndt, Derek (January 1, 2003). "The Climate of Oklahoma". Oklahoma Climatological Survey. Retrieved July 31, 2007. ^ "Managing Upland Forests of the Midsouth". USD Forest Service. March 7, 2007. Archived from the original on June 22, 2008. Retrieved July 31, 2007. ^ a b c "About Oklahoma". TravelOK.com. 2007. Archived from the original on July 7, 2006. Retrieved July 10, 2006. ^ a b c "Oklahoma in Brief" (PDF). State of Oklahoma. 2003. Retrieved August 4, 2007. ^ a b c d "A Look at Oklahoma: A Student's Guide" (PDF). State of Oklahoma. 2005. Archived from the original (PDF) on December 30, 2006. Retrieved August 14, 2007. ^ a b "Oklahoma Ecoregional Maps". Oklahoma Department of Agriculture. Archived from the original on October 13, 2007. Retrieved August 2, 2007. ^ "Oklahoma State Parks". Oklahoma Parks Department. 2004. Archived from the original on July 27, 2007. Retrieved August 2, 2007. ^ a b "Oklahoma National Park Guide". National Park Service. 2007. Retrieved August 2, 2007. ^ "National Forests". United States Department of Agriculture Forest Service. May 1, 2005. Retrieved August 2, 2007. ^ "Ouachita National Forest". United States Department of Agriculture Forest Service. May 10, 2005. Retrieved August 2, 2007. ^ "Tallgrass Prairie Preserve". The Nature Conservatory. 2007. Archived from the original on February 23, 2011. Retrieved July 31, 2007. ^ "Black Kettle National Grassland". USDA Forest Service. July 24, 2007. Retrieved August 2, 2007. ^ "Refuge Locator Map – Oklahoma". U.S. Fish and Wildlife Service. Retrieved August 17, 2007. ^ "Wichita Mountains Wildlife Refuge". U.S. Fish and Wildlife Service. Retrieved August 17, 2007. ^ "Chickasaw National Recreation Area – Park Statistics". National Park Service. Retrieved January 16, 2010. 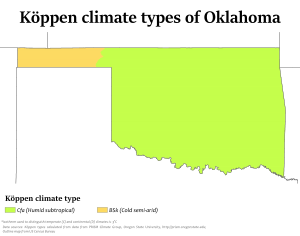 ^ a b c "Oklahoma's Climate: an Overview" (PDF). University of Oklahoma. Retrieved August 1, 2007. ^ "Tornado Climatology". NOAA National Climatic Data Center. Retrieved October 24, 2006. ^ "News | November 11, 1911: A Palindrome to Remember". Mesonet. Retrieved February 6, 2013. ^ "The Tornado Outbreak of April 27–28, 1912". National Weather Service. National Oceanographic and Atmospheric Administration. Retrieved August 20, 2013. ^ Novy, Chris. "SPC and its Products". National Oceanic and Atmospheric Administration. Retrieved August 1, 2007. ^ "Oklahoma Weather And Climate". UStravelweather.com. 2007. Archived from the original on September 27, 2007. Retrieved August 2, 2007. ^ "Weather Averages: Lawton, Oklahoma". MSN Weather. Retrieved August 13, 2007. ^ Palino, Valerie. "Early Man in North America: The Known to the Unknown". Yale-New Haven Teachers Institute. Retrieved August 1, 2007. ^ "The Historic Spiro Mounds". Spiro Area Chamber of Commerce. 2007. Archived from the original on August 8, 2007. Retrieved August 1, 2007. ^ "Prehistory of Oklahoma". rootsweb. Retrieved August 1, 2007. ^ a b c d e "Oklahoma's History". Government of Oklahoma. Archived from the original on July 26, 2007. Retrieved August 1, 2007. ^ "French and Spanish Explorations". rootsweb. Retrieved August 1, 2007. ^ Len Green. "Choctaw Removal was really a "Trail of Tears"". Bishinik, mboucher, University of Minnesota. Archived from the original on June 4, 2008. Retrieved April 28, 2008. ^ Carter, Samuel (III) (1976). Cherokee sunset: A nation betrayed: a narrative of travail and triumph, persecution and exile. New York: Doubleday, p. 232. ^ "1890 Indian Territory Map". RootsWeb. Retrieved May 6, 2009. ^ "Wayback Machine" (PDF). February 1, 2016. Archived from the original (PDF) on February 1, 2016. ^ Rodman, Leslie. The Five Civilized Tribes and the American Civil War (PDF). p. 2. Archived from the original (PDF) on July 23, 2011. ^ Hornsby, Jr., Alton (2008). A Companion to African American History. John Wiley & Sons. p. 127. ISBN 978-1-4051-3735-5. ^ "Map of Cattle Drives in 1881". Genealogy Trails History Group. Retrieved August 1, 2007. ^ Hamilton, Robert. "United States and Native American Relations". Florida Gulf Coast University. Retrieved August 1, 2007. ^ "Factors Influencing Enrollment in Agricultural Education Classes of Native American Students in Oklahoma". Oklahoma State University. 1999. Archived from the original (DOC) on August 8, 2007. Retrieved August 1, 2007. ^ "Rushes to Statehood". National Cowboy and Western Heritage Museum. Archived from the original on September 26, 2007. Retrieved August 1, 2007. ^ "Clem Rogers". Will Rogers Museum Association. Archived from the original on May 20, 2007. Retrieved August 1, 2007. ^ "Tulsa Area History". Tulsa County Library. Archived from the original on January 8, 2007. Retrieved April 25, 2007. ^ Oxman, Steven (May 30, 2000). "The Tulsa Lynching of 1921: A Hidden Story". Variety Magazine. Retrieved June 26, 2008. ^ "Tulsa Race Riot, A Report by the Oklahoma Commission to Study the Tulsa Race Riot of 1921, February 28, 2001" (PDF). Oklahoma Historical Society. Archived from the original (PDF) on June 24, 2008. Retrieved June 10, 2008. ^ O'Dell, Larry. "Ku klux klan". Oklahoma Historical Society. Archived from the original on October 9, 2008. Retrieved June 26, 2008. ^ "1930s Dust Bowl". Cimarron County Chamber of Commerce. August 5, 2005. Retrieved August 1, 2007. ^ "History of the States: Oklahoma, The Sooner State". The History Channel. 2007. Archived from the original on October 10, 2007. Retrieved August 9, 2007. 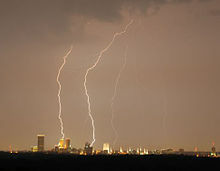 ^ "Oklahoma City Tragedy". CNN. 1996. Archived from the original on August 20, 2007. Retrieved August 1, 2007. ^ Sutton, Joe (April 28, 2016). "Seven dead after record-setting floods in Texas, Kansas – KPAX.com | Continuous News | Missoula & Western Montana". KPAX.com. Archived from the original on June 2, 2016. Retrieved June 3, 2016. ^ "Texas and Oklahoma Set All-Time Record Wet Month; Other May Rain Records Shattered in Arkansas, Nebraska". Weather.com. Retrieved June 3, 2016. ^ "U.S. Decennial Census". United States Census Bureau. Archived from the original on October 19, 2013. Retrieved January 25, 2014. ^ a b "QuickFacts Oklahoma; UNITED STATES". 2018 Population Estimates. United States Census Bureau, Population Division. February 25, 2019. Retrieved February 25, 2019. ^ a b c "Historical Census Statistics on Population Totals By Race, 1790 to 1990, and By Hispanic Origin, 1970 to 1990, For The United States, Regions, Divisions, and States". Census.gov. Archived from the original on July 25, 2008. Retrieved April 23, 2014. ^ "Population of Oklahoma: Census 2010 and 2000 Interactive Map, Demographics, Statistics, Quick Facts". ^ 2010 Census Data. "2010 Census Data". Census.gov. Retrieved April 23, 2014. ^ a b "The American Indian and Alaska Native Population: 2000" (PDF). United States Census Bureau. 2002. Retrieved August 5, 2007. ^ "Oklahoma QuickFacts from the US Census Bureau". State & County QuickFacts. U.S. Census Bureau. January 12, 2006. Archived from the original on May 14, 2008. Retrieved July 10, 2008. ^ Dominic Pulera (2004). Sharing the Dream: White Males in Multicultural America. A&C Black. p. 57. ISBN 978-0-8264-1643-8. ^ Paul Monies, Oklahoma's foreign-born population continues to grow in most counties, The Oklahoman (January 9, 2011). ^ "2010 Census Centers of Population by State". U.S. Census Bureau. 2010. Retrieved September 17, 2011. ^ "State Personal Income 2006". United States Department of Commerce. March 27, 2007. Archived from the original on July 4, 2007. Retrieved August 5, 2007. ^ "More or Less". Oklahoma Chamber of Commerce. Oklahoma Chamber of Commerce. 2007. Archived from the original on October 6, 2007. Retrieved August 5, 2007. ^ a b "Oklahoma Census Data Center News" (PDF). Oklahoma Department of Commerce. July 2007. Archived from the original (PDF) on August 8, 2007. Retrieved July 31, 2007. ^ "Per capita income in Tulsa County highest in state". Tulsa World. November 27, 2012. Archived from the original on October 5, 2012. Retrieved February 6, 2013. ^ a b "City and Town Population Totals: 2010-2017". U.S. Census Bureau. July 6, 2018. Retrieved July 6, 2018. ^ "GCT-PH1 – Population, Housing Units, Area, and Density: 2010 – State — Place and (in selected states) County Subdivision". 2010 United States Census. United States Census Bureau. Retrieved August 8, 2016. ^ "Oklahoma: 2010 Population and Housing Unit Counts 2010 Census of Population and Housing" (PDF). 2010 United States Census. United States Census Bureau. September 2012. p. III-2. Retrieved September 3, 2016. ^ "Oklahoma Statutes Citationized Title 11. Cities and Towns Chapter 1 – Oklahoma Municipal Code Article Article IV – Incorporation of Cities Section 4-101 – Petition for Incorporation of City – Contents". oscn.net. Retrieved July 6, 2017. ^ "2016 Oklahoma Statutes Title 11. Cities and Towns". law.justia.com. Retrieved July 6, 2017. ^ "Oklahoma Statutes Citationized Title 11. Cities and Towns Chapter 1 – Oklahoma Municipal Code Article Article V – City Incorporating as a Town Section 5-101 – City Incorporating as a Town – Procedure". oscn.net. Retrieved July 6, 2017. ^ "Biggest US Cities By Population - Oklahoma - 2017 Populations". American FactFinder2. U.S. Census Bureau. Retrieved February 25, 2019. ^ "Oklahoma votes to make English official language". News OK. November 2, 2010. Retrieved May 17, 2014. ^ a b c d e f g h "Oklahoma-Languages". City-data.com. 2000. Retrieved May 17, 2014. ^ "Cherokee". Ethnologue. Archived from the original on July 30, 2015. Retrieved April 11, 2014. ^ "Languages – Oklahoma". City-data.com. Retrieved June 3, 2016. ^ "Religion in America: U.S. Religious Data, Demographics and Statistics - Pew Research Center". ^ a b "Current Registration Statistics by County" (PDF). ok.gov. January 15, 2018. Retrieved January 23, 2018. ^ a b c "U.S. Religious Landscapes Survey". The Pew Forum on Religion and Life. Retrieved April 22, 2008. ^ "LDS Statistics and Church Facts | Total Church Membership". www.mormonnewsroom.org. Retrieved July 31, 2017. ^ "The Association of Religion Data Archives | State Membership Report". thearda.com. Retrieved December 5, 2013. ^ a b "State Membership Report – Oklahoma". Association of Religion Data Archives. Retrieved August 5, 2007. ^ Wagner, Peter; Sawyer, Wendy (June 2018). "States of Incarceration: The Global Context 2018". Prison Policy Initiative. ^ Sweeney, Catherine (November 27, 2018). "Growth of Oklahoma's Prison Population Slows". The Journal Record. ^ a b c d "State Fact Sheets: Oklahoma". United States Department of Agriculture. July 3, 2007. Archived from the original on July 29, 2012. Retrieved August 1, 2007. ^ a b globalEDGE Michigan State University. "Oklahoma:Corporations". Retrieved September 27, 2011. ^ a b c d "An Overview Of Oklahoma's Target Industries". Oklahoma Department of Commerce. Archived from the original on July 23, 2007. Retrieved August 1, 2007. ^ Ellis, David (2007). "Tax Friendly Places 2007". CNN Money. Retrieved August 8, 2007. ^ "America's Largest Private Companies: Complete List". Forbes. Retrieved September 30, 2011. ^ "GDP by state current dollars". US Bureau of Economic Analysis. Retrieved September 27, 2011. ^ "Per capita real GDP by state". US Bureau of Economic Analysis. Retrieved September 27, 2011. ^ Snead, Mark (2006). "Outlook Update – OKC GM Plant Closing" (PDF). Oklahoma State University. Archived from the original (PDF) on September 1, 2006. Retrieved August 12, 2007. ^ a b c d "The Economic Impact of Oklahoma's Oil & Natural Gas Industry" (PDF). Oklahoma Energy Resource Board. 2008. Archived from the original (PDF) on April 13, 2012. Retrieved October 22, 2011. ^ a b c "Oklahoma Economy at a Glance". United States Department of Labor, Bureau of Labor Statistics. July 1, 2011. Retrieved September 28, 2011. ^ "Impact of Trade in Oklahoma" (PDF). United States Chamber of Commerce. 2005. Archived from the original (PDF) on August 8, 2007. Retrieved August 1, 2007. ^ "Manufacturing Cluster Analysis" (PDF). Oklahoma Chamber of Commerce. 2005. Archived from the original (PDF) on August 8, 2007. Retrieved August 1, 2007. ^ "Baker Hughes Rotary Rigs by State" (PDF). Baker Hughes. Retrieved July 2, 2016. ^ Oklahoma Geological Survey. "Oklahoma Oil and Natural Gas: Components and Long-Term Outlook" (PDF). Retrieved October 22, 2011. ^ United States Department of Energy. "Installed Wind Capacity by State". Archived from the original (xls) on October 16, 2011. Retrieved October 22, 2011. ^ "Oklahoma Energy Statistics". US Energy Information Administration. 2009. Archived from the original on January 13, 2012. Retrieved October 22, 2011. ^ "Energy Consumption by Source and Total Consumption per Capita, Ranked by State, 2009". US Energy Information Administration. 2009. Archived from the original on October 21, 2011. Retrieved October 22, 2011. ^ Institute for Energy Research. "Oklahoma Energy Facts" (PDF). Archived from the original (PDF) on June 13, 2012. Retrieved October 22, 2011. ^ a b "2009 Report on Oil and Natural Gas Activity within the State of Oklahoma" (PDF). Oklahoma Corporation Commission. 2009. Retrieved October 22, 2011. ^ "STACK & SCOOP Overview - Maps - Geology - Counties". www.shaleexperts.com. ^ "Three Of America's Largest Private Companies Call Oklahoma Home". Oklahoma Department of Commerce. December 2, 2005. Retrieved August 1, 2007. ^ a b "Three Fortune's Snapshot: Devon energy". CNN. 2007. Retrieved August 1, 2007. ^ "OG&E Energy, A History of Positive Energy". OG&E Energy. 2012. Retrieved December 15, 2013. ^ EIA (July 27, 2012). "Electric Power Monthly Table 1.17.A". United States Department of Energy. Retrieved August 15, 2012. ^ EIA (July 27, 2012). "Electric Power Monthly Table 1.17.B". United States Department of Energy. Retrieved August 15, 2012. ^ a b "A Welcome From The Commissioner". Oklahoma Department of Agriculture, Food and Forestry. Archived from the original on May 30, 2007. Retrieved August 7, 2007. ^ a b c "2008–09 Facts: Oklahoma Public Schools" (PDF). Oklahoma State Department of Education. 2010. Archived from the original (PDF) on September 28, 2011. Retrieved January 22, 2012. ^ "Public Elementary and Secondary School Student Enrollment, High School Completions and Staff from the Common Core of Data, School Year 2009–10" (PDF). IES, National Center for Education Statistics. p. 11. Retrieved January 22, 2012. ^ "Growth in Oklahoma's State Governments 1992–2002" (PDF). University of Central Oklahoma. February 1, 2006. Archived from the original (PDF) on August 8, 2007. Retrieved August 3, 2007. ^ "Superintendent Garrett announces Oklahoma No. 1 in Pre-Kindergarten". Oklahoma State Department of Education. November 19, 2004. Archived from the original on June 29, 2007. Retrieved August 3, 2007. ^ "Trends in High School Dropout and Completion Rates in the United States: 1972–2009" (PDF). IES, National Center for Education Statistics. pp. 7–8, 37. Retrieved January 22, 2012. ^ "High school diploma or higher, by percentage by state". Statemaster.com. 2004. Retrieved August 20, 2007. ^ "Missouri and the Nation". University of Missouri. February 9, 2007. Archived from the original on October 12, 2007. Retrieved August 3, 2007. ^ "College study should concern Oklahoma policymakers". The Oklahoman. Retrieved May 30, 2018. ^ "America's Best Colleges – 2007". Oklahoma Education Information System. 2007. Archived from the original on September 28, 2007. Retrieved August 3, 2007. ^ "Best Law Schools". U.S. News. 2013. Archived from the original on July 13, 2013. Retrieved July 12, 2013. ^ "Student Center Financial Aid". Oklahoma State Regents for Higher Education. 2008. Archived from the original on March 23, 2008. Retrieved April 6, 2008. ^ a b "NSU Demographics" (PDF). Northeastern State University. 2006. Archived from the original (PDF) on December 1, 2007. Retrieved February 10, 2008. ^ "Rare Eye Condition Takes Center Stage At NSUOCO". Northeastern State University. 2008. Retrieved April 6, 2008. ^ "INBRE Participants". Oklahoma Idea Network of Biomedical Research Excellence. Archived from the original on April 10, 2008. Retrieved April 6, 2008. ^ "OBU Named to The Princeton Review "Best in the West" list". Oklahoma Baptist University. August 26, 2005. Archived from the original on August 8, 2007. Retrieved August 3, 2007. ^ "Oklahoma Colleges: A Profile of College Degree Programs & Post-Secondary Education in Oklahoma". ^ "Fed up with school spending cuts, Oklahoma teachers walk out". The Washington Post. April 2, 2018. Retrieved April 2, 2018. ^ "Native Now : Language: Cherokee". We Shall Remain – American Experience – PBS. 2008. Archived from the original on April 7, 2014. Retrieved April 9, 2014. ^ a b "Cherokee Language Revitalization". Cherokee Preservation Foundation. 2014. Archived from the original on April 7, 2014. Retrieved April 9, 2014. ^ Chavez, Will (April 5, 2012). "Immersion students win trophies at language fair". Cherokeephoenix.org. Retrieved April 8, 2013. ^ Lew, Allen. "What is geography?". Northern Arizona University. Archived from the original on May 10, 2007. Retrieved August 4, 2007. ^ Greene, Wayne. "Largest Ancestry". Valparaiso University. Archived from the original on March 5, 2010. Retrieved August 4, 2007. ^ Smith, Diane. "Universities partner to save dying languages". Associated Press. June 2011. Retrieved on October 23, 2015. ^ "Oklahoma Quick Facts". Oklahoma Department of Tourism. 2007. Archived from the original on May 17, 2007. Retrieved August 4, 2007. ^ "Fodor's Choice: Top Overlooked Destinations". Fodor's Magazine. 2007. Archived from the original on April 5, 2007. Retrieved August 2, 2007. ^ "Generosity Index 2006 (2004 data)". Catalogue for Philanthropy. 2006. Archived from the original on November 4, 2014. Retrieved November 4, 2014. ^ a b "Filmmaker to share documentary chronicling local poet's life". Sacramento State University. February 25, 2003. Retrieved April 4, 2008. ^ Greene, Wayne (July 15, 2007). "Oklahoma centennial quiz". Tulsa World. Retrieved July 2, 2016. ^ a b "Museums of Oklahoma". Tufts University. Retrieved August 5, 2007. ^ a b c d e f "Oklahoma – A Great Place to Play". Oklahoma Department of Commerce. 2007. Archived from the original on June 27, 2007. Retrieved August 4, 2007. ^ "Oklahoma's Diversity". Oklahoma Department of Commerce. 2007. Archived from the original on June 27, 2007. Retrieved August 4, 2007. ^ "Oklahoma Mozart Festival". OK Mozart Festival. 2007. Archived from the original on September 28, 2007. Retrieved August 4, 2007. ^ "Ballet Russes". Geller/Goldfine Productions. 2009. Retrieved February 16, 2014. ^ "Capri Films" (PDF). Geller/Goldfine Productions. 2008. Archived from the original (PDF) on June 24, 2008. Retrieved June 17, 2008. ^ a b World's own Service. "Ridge Bond, Oklahoman – Tulsa World: Archives". Tulsa World. Retrieved June 3, 2016. ^ a b c "Oklahoma Today February–March 1998 Volume 48 No. 2: 1997 Year in Review" (PDF). Digital.library.okstate.edu. Retrieved June 3, 2016. ^ "Oklahoma! : Rodgers & Hammerstein : Show Details". Rnh.com. Retrieved June 3, 2016. ^ "Photographic image : Berliner Festwochen : Oklahoma!" (JPG). Ridgebond.com. Retrieved June 3, 2016. ^ "Ridge Bond Archives – Images". Ridgebond.com. September 21, 1951. Retrieved June 3, 2016. ^ a b "OHS Podcasts". Okhistory.org. March 24, 2012. Archived from the original on June 29, 2016. Retrieved June 3, 2016. ^ "December 2013 Oklahoma: Magazine of the Oklahoma Heritage Association by Oklahoma Hall of Fame". Issuu. Retrieved June 3, 2016. ^ "Musical Actor to Be Honored With Hall of Fame Award". News OK. November 7, 1993. Retrieved June 3, 2016. ^ Elliott, Matt (March 25, 2007). "Cain's Ballroom – A Music Icon: Venue is a landmark for Western swing, punk fans". Tulsa World. Retrieved July 2, 2016. ^ Stancavage, John (July 15, 2006). "Selling Tulsa: Branded". Tulsa World. Archived from the original on August 11, 2007. Retrieved August 4, 2007. ^ "The All-Terrain Vacation". Travelok.com. Archived from the original on April 10, 2006. Retrieved August 4, 2007. ^ "Mabee-Gerrer Museum of Art, Travel OK". Travelok.com. Retrieved November 22, 2011. ^ "About the Museum". Oklahoma City Museum of Art. Archived from the original on August 9, 2007. Retrieved August 4, 2007. ^ Cross, Robert S. (September 7, 2006). "100 and 1: State's centennial is named top-ranked bus-tour destination". Tulsa World. Retrieved July 2, 2016. ^ "Oklahoma State Fair Opens September 14" (PDF). Oklahoma State Fair. September 11, 2006. Archived from the original (PDF) on June 29, 2007. Retrieved August 4, 2007. ^ "Tulsa State Fair – General Information". Tulsa State Fair. 2007. Archived from the original on August 28, 2007. Retrieved August 25, 2007. ^ Bell, Leigh (May 21, 2007). "Mayfest: Celebrating Downtown: Festival closes after big year". Tulsa World. Archived from the original on September 10, 2016. Retrieved May 21, 2007. ^ "Medieval Fair of Norman". Medieval Fair of Norman. 2010. Archived from the original on July 27, 2011. Retrieved February 14, 2010. ^ "WNBA Approves Relocation of Shock from Tulsa to Dallas-Fort Worth" (Press release). Women's National Basketball Association. July 23, 2015. Retrieved November 9, 2015. ^ "WNBA's Dallas Wings Introduced in DFW Metroplex" (Press release). Women's National Basketball Association. November 2, 2015. Retrieved November 9, 2015. ^ Hibdon, Glenn (July 29, 2007). "Pro soccer: Soccer comes to Tulsa". Tulsa World. Retrieved August 5, 2007. ^ "BA Team Valuations – No. 29 New Orleans Hornets". PGA. January 25, 2007. Retrieved August 5, 2007. ^ "Sonics, city reach settlement". The Seattle Times. July 2, 2008. Archived from the original on June 3, 2009. Retrieved July 2, 2008. ^ "Big 12 Conference – One True Champion". Big 12 Conference. Retrieved November 9, 2015. ^ "Attendance Records" (PDF). National Collegiate Athletic Association. 2011. Retrieved October 20, 2011. ^ "America's Best Sports Colleges: 1–10". Sports Illustrated. October 7, 2002. Retrieved August 5, 2007. ^ "America's Best Sports Colleges: 11–100". Sports Illustrated. October 7, 2002. Retrieved August 5, 2007. ^ "About TU". Tulsa Golden Hurricane. Retrieved November 9, 2015. ^ "Home Page". Oral Roberts Golden Eagles. Retrieved November 9, 2015. Move the cursor over "Sports" on the menu to see a list of varsity sports; football is not listed. ^ "Oral Roberts". The Summit League. Retrieved November 9, 2015. ^ "Home Page". Great American Conference. Retrieved November 9, 2015. Move the cursor over "The GAC" on the menu to see a list of members; six members are from Oklahoma. ^ "About the Heartland Conference". Heartland Conference. Retrieved November 9, 2015. ^ "Lone Star Conference History". Lone Star Conference. Retrieved November 9, 2015. ^ "About the MIAA". Mid-America Intercollegiate Athletics Association. Retrieved November 9, 2015. ^ "NAIA Member Schools: Oklahoma". National Association of Intercollegiate Athletics. Retrieved November 10, 2015. ^ "Oklahoma's Top 10 Private Golf Courses". Tulsaweb. Retrieved August 5, 2007. ^ "Southern Hills Country Club is rich in History". PGA. 2007. Retrieved August 5, 2007. ^ "Rodeo History". Guymon Rodeo Foundation. Archived from the original on May 25, 2007. Retrieved May 2, 2007. ^ a b "Health Report: Oklahoma". Trust for America's Health. Retrieved August 2, 2007. 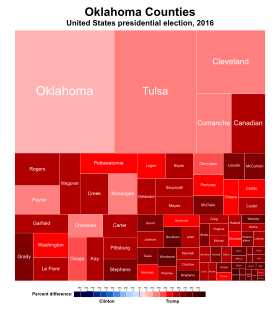 ^ "State health workforce profiles:Oklahoma" (PDF). United States Department of Health and Human Services. Archived from the original (PDF) on February 17, 2011. Retrieved August 2, 2007. ^ "Health insurance, lack of coverage among adults: State, 2002–2005". United States Department of Health and Human Services. Archived from the original on October 12, 2007. Retrieved September 8, 2007. ^ "U.S. Obesity Trends". Centers for Disease Control and Prevention. Archived from the original on August 25, 2009. Retrieved September 12, 2009. ^ Hitti, Miranda (June 13, 2007). "How States Rank on Health Care". WebMD Health News. Retrieved January 26, 2012. ^ "OU Medical Center Employment Opportunities". University of Oklahoma. Archived from the original on August 17, 2007. Retrieved August 2, 2007. ^ "Trauma One Center". University of Oklahoma. Archived from the original on July 21, 2007. Retrieved August 2, 2007. 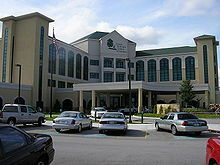 ^ "Southwestern Regional Medical Center". Cancer Treatment Centers of America. Retrieved May 7, 2007. ^ "Tulsa Regional Medical Center Changes its name to OSU Medical Center". Oklahoma State University. 2007. Archived from the original on October 13, 2007. Retrieved August 2, 2007. ^ "Basic Biomedical Research in the OSU College of Osteopathic Medicine". Oklahoma State University. Archived from the original on September 1, 2006. Retrieved August 2, 2007. ^ a b "2011 Top Media Outlets: Newspapers, Blogs, Consumer Magazines & Social Network" (PDF). BurrellesLuce. 2011. Retrieved October 17, 2011. ^ "Local Television Market Universe Estimates Comparisons of 2008–09 and 2009–10 Market Ranks" (PDF). Nielsen Media. Retrieved October 17, 2011. ^ "Historical Highlights of Television in Tulsa, Oklahoma". Tulsa TV History. Retrieved August 6, 2007. ^ "U.S. Television Stations in Oklahoma". Global Computing. 2007. Archived from the original on September 27, 2007. Retrieved August 6, 2007. ^ a b "History of Newspapers in Oklahoma". Oklahoma Historical Society. Retrieved August 6, 2007. ^ "Oklahoma Fun Facts". Legends of America. 2007. Archived from the original on November 7, 2006. Retrieved August 6, 2007. ^ "Complete List of Radio Stations in the State of OK". On the Radio.net. 2006. Retrieved August 6, 2007. ^ Federal Communications Commission. "Call Sign History". Retrieved May 16, 2010. ^ a b "Transportation in Oklahoma City". Oklahoma City Chamber of Commerce. 2007. Retrieved August 2, 2007. ^ "Route 66 – Facts and Trivia". Legends of America. 2007. Archived from the original on August 9, 2007. Retrieved August 2, 2007. ^ "2008 Annual Average Daily Traffic" (PDF). Oklahoma Department of Transportation. 2008. Retrieved September 28, 2011. ^ "Deficient Bridges by State and Highway System". United States Department of Transportation – Federal Highway Administration. 2010. Retrieved September 28, 2011. ^ "Aviation Activity Report December 2010" (PDF). Oklahoma City Airport Authority. 2010. Archived from the original (PDF) on March 17, 2012. Retrieved September 30, 2011. ^ "Passenger Boarding (Enplanement) and All-Cargo Data for U.S. Airports" (PDF). Federal Aviation Administration. 2010. Archived from the original (PDF) on September 20, 2011. Retrieved September 30, 2011. ^ "Tulsa International Airport – Airline Information". Tulsa Airport Authority. 2007. Archived from the original on September 28, 2012. Retrieved August 2, 2007. ^ "Will Rogers World Airports – Airline Information". Oklahoma City Airport Authority. 2004. Archived from the original on March 15, 2011. Retrieved August 2, 2007. ^ "Riverside Jones Airport". Tulsa Airport Authority. 2007. Archived from the original on August 22, 2011. Retrieved September 30, 2011. ^ "Airports of Oklahoma". Oklahoma Airport Operators Association. Archived from the original on September 28, 2007. Retrieved August 2, 2007. ^ Barber, Brian (January 18, 2007). "Federal matching funds may help bring Amtrak to Tulsa". Tulsa World. Archived from the original on September 10, 2016. Retrieved August 2, 2007. ^ "Live in Tulsa". 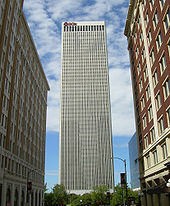 Tulsa Chamber of Commerce. 2005. Archived from the original on May 25, 2007. Retrieved July 14, 2007. ^ a b "What's new at the port?". Tulsa Port Authority. Archived from the original on July 14, 2007. Retrieved July 30, 2007. ^ "State Government – Oklahoma". GoveEngine.com. 2006. Retrieved July 31, 2007. ^ "Current Registration Statistics by County" (PDF). State of Oklahoma. January 15, 2013. Retrieved May 21, 2013. ^ "The Execution State?". Oklahoma Watch. February 21, 2013. Retrieved July 10, 2013. ^ a b "Oklahoma State Government". Netstate. June 7, 2007. Retrieved August 1, 2007. ^ "Legislative Longevity Limits". U.S. Term Limits. Archived from the original on September 20, 2007. Retrieved August 9, 2007. ^ "Report of the Governor's Commission on Government Performance". Governor's Commission. December 1, 1995. Archived from the original on April 29, 2007. Retrieved August 6, 2007. ^ "List of County Officers". Government of Oklahoma. January 6, 2006. Archived from the original on May 31, 2007. Retrieved August 1, 2007. ^ a b "Oklahoma Municipal Government" (PDF). Oklahoma Department of Libraries. 2005. Retrieved August 7, 2007. ^ Diehl, Don (July 24, 2007). "Metro About Jenks population figures ... doubled in size since 2000 census". Neighbor Newspapers. Archived from the original on September 30, 2007. Retrieved August 1, 2007. ^ Henry, Robert (March 22, 1989). "Oklahoma Attorney General's Opinions: Question Submitted by: The Honorable Enoch Kelly Haney, Oklahoma State Senate". The Oklahoma State Courts Network. Retrieved August 21, 2007. ^ Robertson, Lindsay (2001). "Native Americans and the Law: Native Americans Under Current United States Law". University of Oklahoma. Retrieved August 21, 2007. ^ Leip, David. "Presidential General Election Results Comparison – Oklahoma". US Election Atlas. Retrieved December 29, 2009. ^ "Registration by Party as of January 15, 2015" (PDF). Oklahoma State Election Board. Retrieved February 6, 2015. ^ Dems woo Native American vote. Politico. Published 5/29/08. ^ a b Oklahoma Department of Commerce. "2000–2010 Oklahoma Incorporated Place Populations". Archived from the original (xls) on May 20, 2011. Retrieved October 9, 2011. ^ "P1 Total Population All Metropolitan and Micropolitan Statistical Areas (or parts) within Oklahoma". US Census Bureau. 2010. Retrieved October 9, 2011. ^ "OCIS Document Index". The Oklahoma Supreme Court Network. Retrieved May 11, 2007. ^ "Oklahoma House approves 'In God We Trust' for state motto". newsok.com. Retrieved March 27, 2018. ^ "HCR 1024" (PDF). Retrieved March 27, 2018. Baird, W. David; Danney Goble (1994). The Story of Oklahoma. Norman: University of Oklahoma Press. ISBN 978-0-8061-2650-0. Dale, Edward Everett; Morris L. Wardell (1948). History of Oklahoma. New York: Prentice-Hall. Gibson, Arrell Morgan (1981). Oklahoma: A History of Five Centuries (2nd ed.). Norman: University of Oklahoma Press. ISBN 978-0-8061-1758-4. Goble, Danney (1980). Progressive Oklahoma: The Making of a New Kind of State. Norman: University of Oklahoma Press. ISBN 978-0-8061-1510-8. Gunther, John (1947). "Oklahoma and the Indians". Inside U.S.A. New York City, London: Harper & Brothers. pp. 869–885. Morgan, David R.; Robert E. England; George G. Humphreys (1991). Oklahoma Politics and Policies: Governing the Sooner State. Lincoln: University of Nebraska Press. ISBN 978-0-8032-3106-1. Morris, John W.; Charles R. Goins; Edwin C. McReynolds (1986). Historical Atlas of Oklahoma (3rd ed.). Norman: University of Oklahoma Press. ISBN 978-0-8061-1991-5. This page was last edited on 9 April 2019, at 03:20 (UTC).